If you love pancakes, and Las Vegas, and want to get married tomorrow but have no standing plan to do so, do we have a deal for you! Turns out the Denny’s in Las Vegas offers a line of low-cost nuptials for the impulsive bride and groom. Well, not that impulsive: The Denny’s wedding chapel does require two whole hours’ notice. Once you pass that bar, the $99 package will include the ceremony, silk flowers, champagne toast, and a certificate to show that you actually went through with this and got married at a Denny’s. 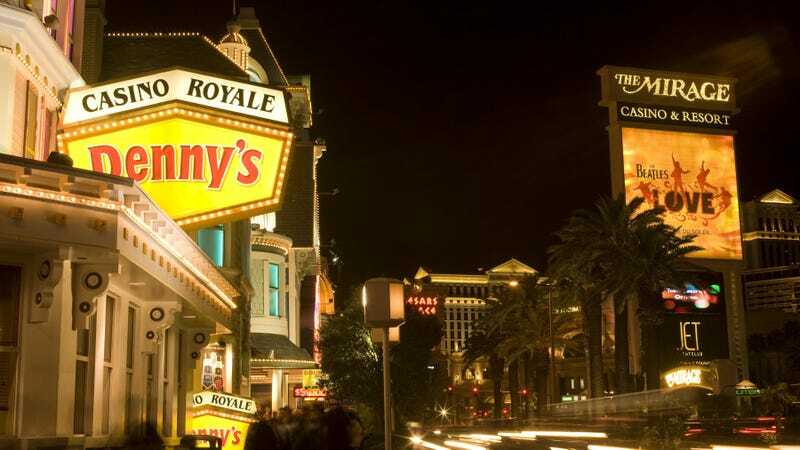 The big spenders at the $199 level also get use of a photo booth, two souvenir T-shirts, a “Wedding Pancake Puppies Cake” (we’re curious), and two Grand Slam breakfasts—good for your very next visit to Denny’s! If a pancake wedding is just not your jam, no worries: The Taco Bell in Las Vegas just started offering weddings this past August. That ceremony is a bit pricier at $600—but it does include a “sauce packet bouquet” for the bride “to borrow.” Could McDonald’s be next? After all, it’s already got the ring.